This will be my final post before the lucky few (who include HM The Queen, but not me this year) are granted early admittance to The Chelsea Flower Show. The weather has taken a distinctly Chelsea turn, reverting from warm, dry and sunny to cool, showery and unpredictable. As I write, Tuesday and Wednesday look to be dry days, so hopefully I can leave my umbrella, galoshes and waterproof notebook at home. 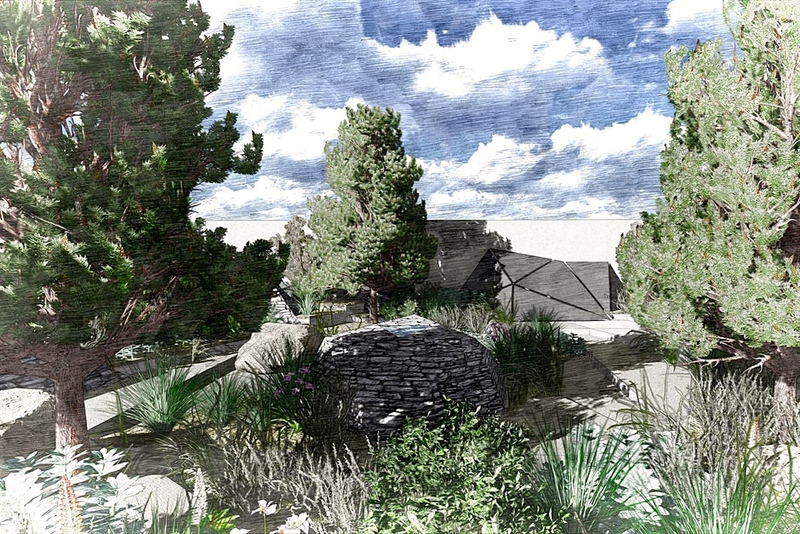 Having taken inspiration from the arid landscapes of Jordan, Hugo Bugg, mastermind behind of the Royal Bank of Canada Garden, will be holding out for a mini heat wave to bring out the best in his powerful design. Like Cornishman Sam Ovens, Devonian Hugo is employing huge pines to shade his garden, which explores the connections between water, people and life. The conifers in question, Pinus halepensis, are not native to the UK, but to countries with Mediterranean shores. 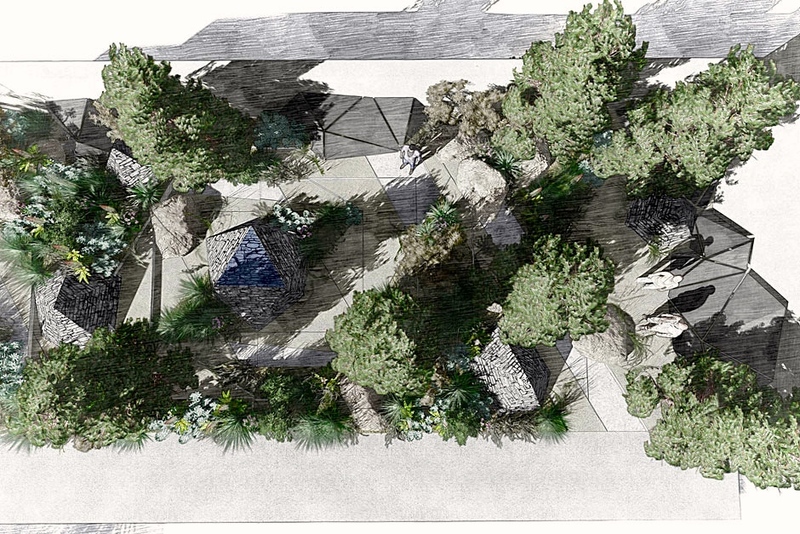 They will preside over a landscape of tesselated grey slabs arranged around pyramidal stone cairns. This is classic Hugo Bugg; clever, modern, abstract and architectural. Designed to celebrate water as an entity sacred to humankind, a pivotal triangular pool will be raised aloft like a contemporary font. What I’ve liked about Hugo’s previous show gardens is that they have made me think. His Chelsea gold medal winning garden for the same sponsor in 2014 was cool and composed, but took a little working out. The careful arrangement of angles concealing and directing water around the garden were masterfully realised and fascinating to fathom. 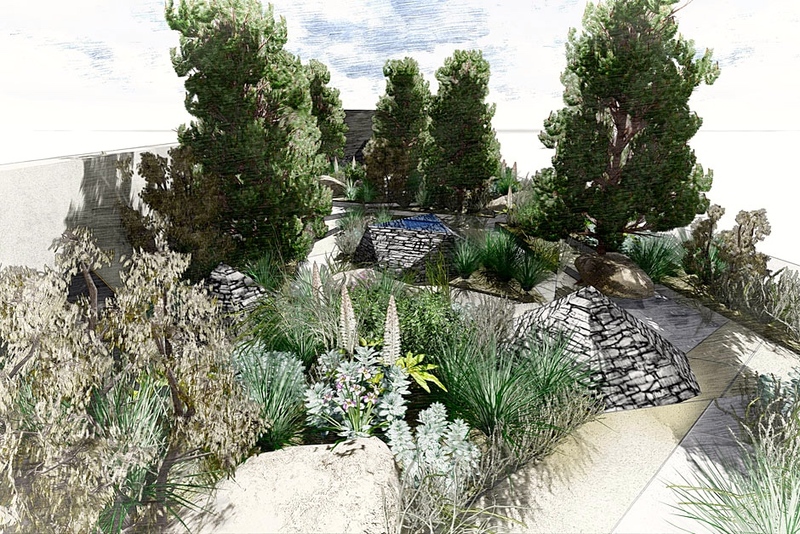 My only concern about this year’s design is that it looks rather brooding and colourless on paper, but some lively planting should create light and texture beneath the towering mass of the trees. The Jordanian Dibeen Forest Reserve which inspired Hugo is one of the last remaining examples of a pine and oak forest in the Middle East. Its limestone landscape is dominated by Aleppo pine (Pinus halepensis), Palestine oak (Quercus calliprinos) and Aleppo oak (Quercus infectoria). Other typical Dibeen flora includes orchids, Greek strawberry tree (Arbutus x andrachnoides), pistachio (Pistacia lentiscus), and olive. The forest’s age structure shows wide variation, with many areas comprising mature forest and a vigorous young understorey. In the cool shade of pines visitors might spot the towering white spikes of sea squill (Urginea maritima) or the inky-black flowers of Iris nigricans, Jordan’s national flower. Reflective silver foliage will feature in the form of Onopordum jordanicolum, Artemisia alba ‘Canescens’ and Fibigia clypeata (Roman shields). The combination should make for an interesting and unexpected tapestry, inspiring gardeners to create a little bit of the Middle East back at home in Middlesex, Middlesborough or Margate. However you plan to experience the Chelsea Flower Show this year, I hope you enjoy every moment. ‘Water as an entity sacred to humankind’, definitely my kind of gardener. Fingers crossed for a gold for Hugo. Looking forward to seeing the real thing. I wish that I could see this in person! I love the use of trees and water in the plans. I will attempt to take photographs that are good enough to transport you there Laurie! Well, the recording thing attached to the television is all set for this week and I will catch up when I can, even if into the weekend. I will see how the BBC presents things this year but I do have the advantage of being able to fast-forward through anything that looks tedious. Have a great week. Good luck on your exhibition garden at Chelsea. Don’t forget to add a few thrown down bottles & cans plus the odd black bag hanging in the tree which the reserve in Jordan hand out for free so picknickers will take home their rubbish, which sadly they do not. It is nevertheless a beautiful subject if you look passed the rubbish. Thank you for your comment Jeanette. I wish it were my exhibition garden, but that honour goes to Hugo Bugg, who created a garden I am sure all Jordanians would be proud of. I am sorry to say things are not an awful lot better here in the UK. Sadly it seems littering is a global plague.